James Earl Goad has conducted the General Practice of Law in Cartersville for the last 15 years. James is from Tompkinsville, Kentucky. He has owned and operated many business: Sears Catalog Store, an Auto Body Shop and Commercial Glazing Companies in Kentucky and Georgia. James got his undergraduate degree from Lindsey Wilson College in Columbia, Kentucky. 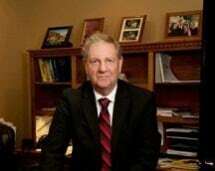 He attended Thomas M. Cooley Law School (Lansing, Michigan) and earned his J.D. degree from John Marshal Law School here in Atlanta. James has been married to Wanda Ryherd for 24 years. They have between them 8 children, 13 grandchildren and one great-grandchild. James has been admitted to practice in the Georgia Supreme Court, Georgia Court of Appeals, U. S. District Court and the Bankruptcy Court for the Northern District of Georgia. He is a member of the Georgia Association of Criminal Defense Attorneys and Association of Trial Lawyers of America.